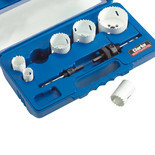 Ideal for producing perfectly sized plugs to fill counter bored holes. 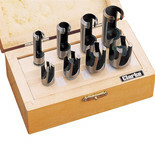 The CHT367 set includes standard and chamfered cutters for cutting a wide range of plug diameters. 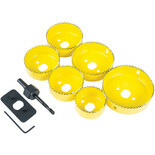 For cutting neat holes in wood, plastics, plasterboard etc., this useful set of eight circular blades will cover the majority of installation and building requirements for both Trade and DIY. 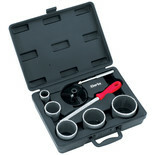 Designed for the accurate installation of downlights, this nine piece set includes an arbor, hex key wrench and reinforcing plate to help ensure accuracy. 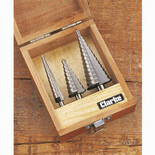 Ideal for plumbers! 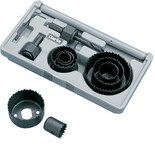 6 popular sizes of bi-metal hole cutters plus a hex drive adaptor and pilot drill. 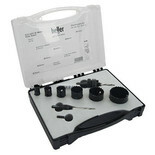 And it all comes in a really useful moulded storage case. 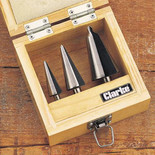 Ideal for electricians! 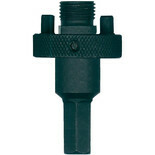 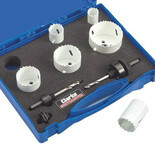 Clarke's hole cutter set includes 6 popular sizes of bi-metal hole cutters plus a hex drive adaptor and pilot drill. 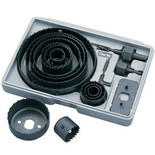 And it all comes in a really useful moulded storage case. 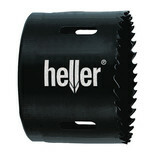 Heller 19094 7 Shank For Hole Saws with a diameter of 32-152mm. 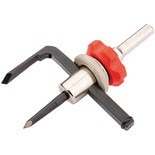 For use with hand brace or power drill for cutting wood and plastic. 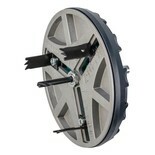 This hole saw from Wolfcraft has an ingenous mechanism which allows the cutting diameter to be adjusted from 45mm to 130mm and automatically moves all three cutting blades synchronously.